This summer recipe brings together the sweetness of peppers and the saltiness of the filling. Tasty! Maybe using the oven in the middle of a heatwave is not ideal, but who needs to stay in the kitchen anyway? Just set the timer and go! When it’s ready, just let it cool, sit down and enjoy. Halve the red peppers lengthways, remove the seeds and partitions, wash and set aside. In a bowl mix the breadcrumbs, garlic, herbs, egg, milk, mozzarella and olives together (you can either slice them or leave whole, just make sure they don’t have any stones). Pre-heat the oven at 180 degrees Celsius. In a roasting tray, drizzle 2 tablespoons of olive oil. 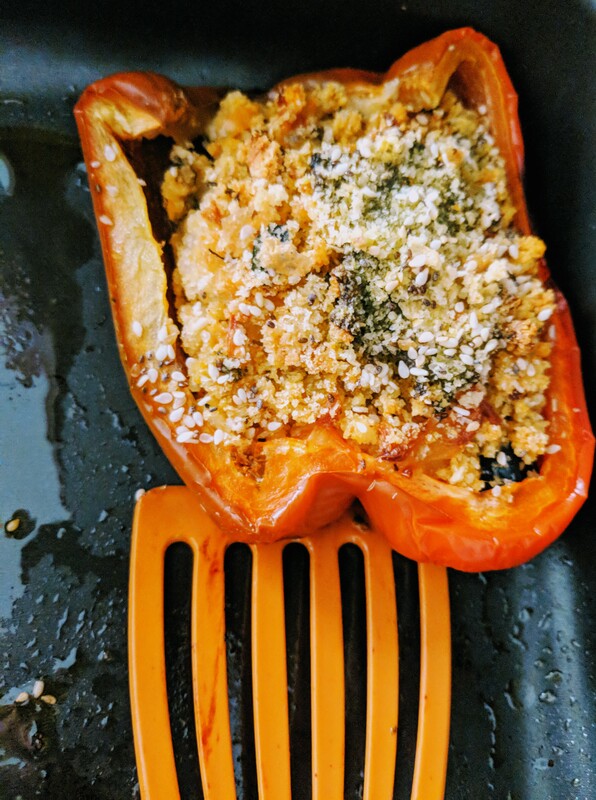 Fill the peppers with the breadcrumb mix, spoon over them a bit of pesto then sprinkle some sesame seeds and some more breadcrumbs if you have any left. Place the stuffed peppers in the oiled tray and drizzle them with the remaining olive oil. Roast for 40 minutes until you see a golden crust and the flesh of the peppers looks soft. You can enjoy them lukewarm or at room temperature. Serve with a fresh mixed salad. As you can see from the comments on Instagram, the first thing that springs to mind when people see this summer recipe is: yummy!